Table tomb outside repaired entrance door. 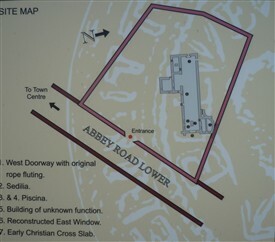 The Augustinian Abbey is now within the town boundaries of Ballinrobe off Abbey Street on the Cloongowla Road. It is within its own graveyard, on raised ground, just above the former flood plains of the River Robe which is close by. 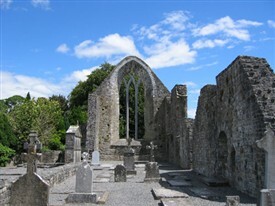 The restoration of the Abbey was undertaken by the Lough Mask and Lough Carra Tourist Development Association, together with Fás, and was completed in 1994. Bridie Mulloy produced a booklet, The Restoration of the Ballinrobe Priory (Abbey) for its opening by Her Excellency President Mary Robinson. It is open to the public throughout the year, and during the summer of 2009 Ruaidhri de Barra erected a plaque with a copy of the Seal of the Priory within the grounds. The arrival of the Cambro-Normans in the 12th century, and their subsequent spreading out to most parts of Ireland, brought many changes. From the 12th century we see fundamental changes in the organisation of the Church in Ireland also. The Church, which had dominated Early Christian life, became organised into dioceses with parishes all over the country. The Normans introduced continental orders, who brought their plans and arrangements of monastic layouts with them. Each order had its own layout. 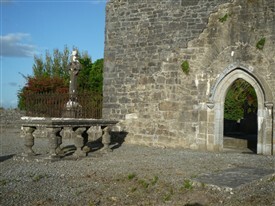 The Augustinian Canons Friary, with Ballinrobe being the first of nine foundations west of the Shannon, was very significant. Its date of foundation is uncertain, but we know it was in existence c 1337, as it was mentioned in the Register of the Dominican priory of Athenry. It is probable that the foundation was patronized by Elizabeth de Clare, granddaughter of Edward 1st. She was the wife of John de Burgh, son of Richard de Burgh of Ulster, and also his heir, who ceded them the manors of Lough Mask and Ballinrobe c 1308. The erection of the friary in Ballinrobe was possibly to celebrate the birth of their son. 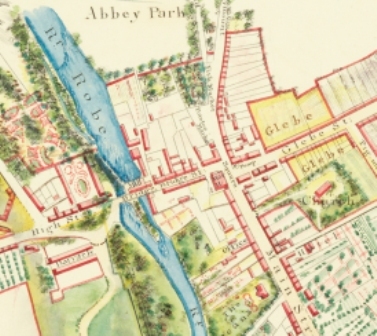 However, in an unpublished history of the Augustinians in their Archives at St. John Lane, Dublin, it is claimed that the Abbey was founded for the order in 1337 by Roger Taffe. It may well have been on behalf of the Burkes. It must originally have been a wealthy monastery due to gifts of land and family treasures, donated by young men who joined the order. According to tradition, only men of noble birth were admitted into the Augustinian Order. 1338 saw Edmund de Burgh son of Richard (the Red Earl) of Ulster being taken prisoner by his cousin Edmund Albanach de Burgh and being held at the Ballinrobe friary before been taken to what is now known as the Earl’s Island in Lough Mask a short distance away via the River Robe. While negotiations for his release were in progress with the Archbishop of Tuam, he was drowned by some of the Burke Stauntons thus ending English rule in Mayo for many years. In 1584 the Augustinians had approximately 120 acres of land, a mill and water course, that had been the property of the Knight’s Hospitallers of St. John of Jerusalem, who had property further along the river to the east at Friarsquarter East. One of the Hospitallers, Stephen de Fulburn, became Archibishop of Tuam in 1286, while still King’s Viceroy and died in 1288. Following enquiries, Fr. David Kelly OSA, Augustine Archivist very kindly shared a handwritten manuscript by Louis W. Carr. OSA, written in 1939 about St. John’s House which, will be available, in due course, in a separate article. We know that Friars were in occupation in 1574 and again after the rebellion of 1641 in spite of Henry Vlll, his son Edward and Elizabeth l st's ownership of all property in Ballinrobe. 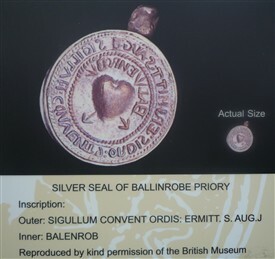 During the summer of 2009 a plaque displaying a copy of the Seal of Ballinrobe Monastery was erected within the Abbey Grounds by Ruaidhri de Barra, Ballinrobe. The original currently belongs to the British Museum, London.